Do nice things ever come in very small and very cheap packages? Is it smart enough to thrive at a low, low price? Motorola's MotoSmart is the Google-owned company's most affordable (it hates it when we say "cheapest") phone yet, with the small 3.5-inch model arriving on Pay As You Go for around the £99 (around AU$155/US$159) price point, or £7 (AU$10.98/US$11.25) per month on contract. For that pretty reasonable sum you get a single-core 800MHz processor running Android 2.3.6, which works well and has loads of users around the world, but is rapidly falling out of fashion as Android users demand newer versions of Google's mobile operating system. Still, for the low price, you can't expect a phone at the very cutting edge of the smart scene. But is there enough in here to compete with the likes of Android's current budget superstar, the Huawei Ascend G300? First impressions of the Motorola MotoSmart - also known as the Motorola XT389 - are really quite positive. Yes, it's a very boring-looking, generic black rectangle, but it has a weight (115g/0.25lbs, to be exact) and solidity to it that makes it feel a little more prestigious than some of the other budget clunkers that litter the cheaper end of the Android phone world today. And impressions are improved a little more around the back. The 3MP logo on the camera sensor is a sign of further disappointments to come, but the metallic grille and similarly metal-made slide-off back cover again give the Motorola MotoSmart a nice little design edge, reminding us of the Milestone, the Defy and to some degree the Motoluxe. Beneath this sits the Motorola MotoSmart's modest 1,400mAh battery, alongside a welcome microSD card for your legacy media files. Our unlocked model came with a 2GB SD card already fitted, so that's enough space for a few tunes and videos to be getting on with. Four capacitive touch buttons sit beneath the display, offering a reliable way of accessing your Menu, Home, Back and Search options. There's a little bit of extra chin beneath the buttons to raise them up the chassis a little, making the Motorola MotoSmart easy to use with one hand. All quite promising so far. The top-right corner houses the phone's power button and volume up/down toggle, which are pretty solid and presented with a little metallic sheen that matches the slim silvery bezel around the face of the phone. Nobody's going to mistake it for a high-end Samsung phone such as the Galaxy S3, but it's inoffensive and chunky enough to convince you it'll survive the odd bit of tough love and the occasional drop. It's not the slimmest phone around, at 11mm (0.4 inches) thick, so won't be entering that particular boasting contest with super thin phones such as the iPhone 5 and Galaxy S3. But the rubberised metal back cover and compact form factor make it fit the hand well, with the smaller 3.5-inch display meaning it's easy to use with one hand. Even the skinniest of nerd fingers can reach the bottom buttons and top notifications area with ease. 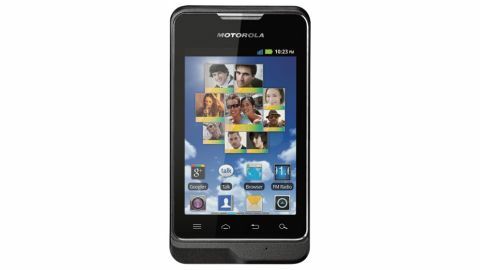 Then you turn the Motorola MotoSmart on and it starts to go downhill pretty rapidly. The 3.5-inch display is fairly bright, but the low and outdated 320 x 480 resolution means you immediately see a rather last-generation collection of low-res icons. The capacitive display is quite sensitive to the touch, so navigating the home screen is pain-free, but you can't help but squint a bit at the fuzzy fonts. So, we liked the Motorola MotoSmart, then we didn't like it. Who knows how the rest of this tale will unfold?